Winter can be great. Watching the first snow fall, skiing, snowboarding, sledding and building snowmen can be a lot of fun. But, winter isn’t always nice. Chances are if you live somewhere it snows, or vacation in such areas, winter driving conditions can get pretty difficult and downright dangerous at times. Sure, you can wait for a snow storm or freezing rain to pass, but what if you’re one the road already? In freezing temperatures, things can go downhill pretty fast, especially if your car gets stuck or breaks down. 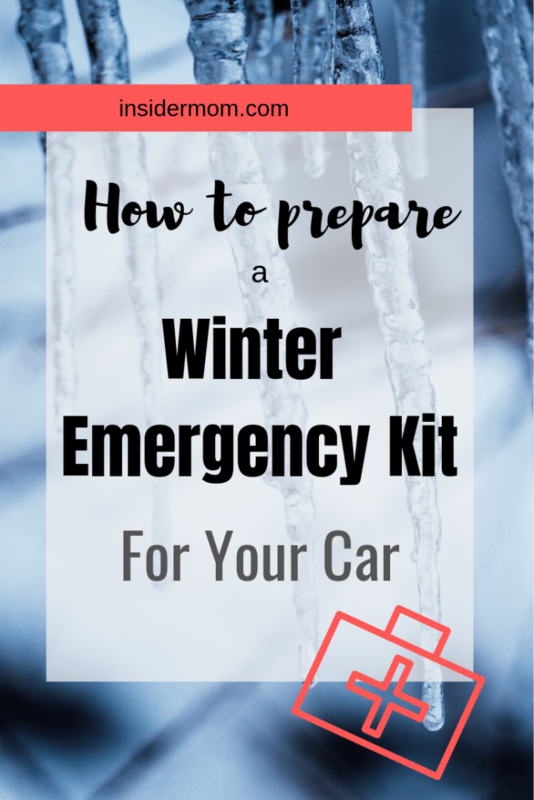 One way to make sure you’re prepared is to put together a robust winter emergency kit for your car. If you’re traveling with your family and kids or other passengers, you are going to want to have enough supplies to help you get your car out of those conditions while keeping everyone warm. A scraper cone – Scraper cones are super helpful for getting ice off the windshield and I use it in combination with the windshield brush and scraper, for areas that are tough to work around. Traction mats – Chances are if your tires are stuck, you’ll need these traction mats. Tire chains – Check to see if they are allowed in your area. You might not be able to use them while driving around, but might be able to use them in an emergency to get your car unstuck. Self contained battery jumper – This battery jumper is helpful because you don’t have to wait for another car to drive by and it was recommended by the author of the Skilled Survivor blog. Hand and Toe warmers. You can use hand and toe warmers to stay warm without an external heat source. Food & Water – There are emergency food kits that have up to a 5 year shelf life, so you don’t have to constantly worry about replacing them. There are also food packs that you just add water to to make a meal. Playing cards – It makes sense to have cards or games to pass the time as you wait for another motorist or rescue crew to arrive. These survivor cards were also recommended on the Skilled Survivor blog. Shaving cream to de-fog windshield, mirror (and driving glasses if you use them) . All you have to do is clean the glass with it. While this might seem like a lot, chances are you might already have several of the items. Gathering together what you do have and including whatever else you need, can help keep you and your family safe and warm until rescue crews arrive or until someone else spots your car. If you live out in more rural areas or if you live in a city, but travel for winter sports, or even if your car is just stuck on the highway during a blizzard, you’re going to want to be prepared. 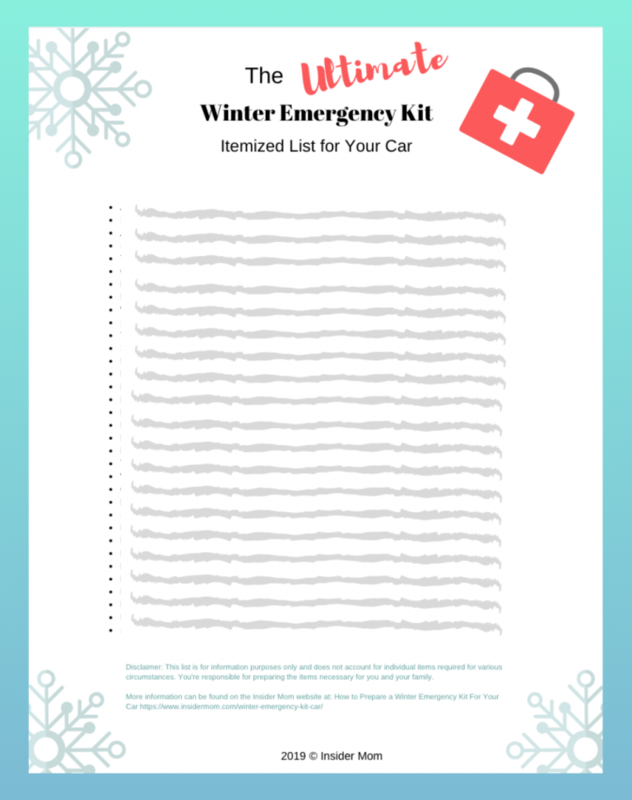 Are there any additional items you keep in your car’s winter emergency kit? We’d love to hear about them in the comments. Disclaimer: This post is for information purposes only and does not account for individual items required for various circumstances. You’re responsible for preparing the items necessary for you and your family.